Kihei Oasis is a legally permitted vacation rental home which opened it's doors for rentals in June 2013! Permit #STKM 20130014. 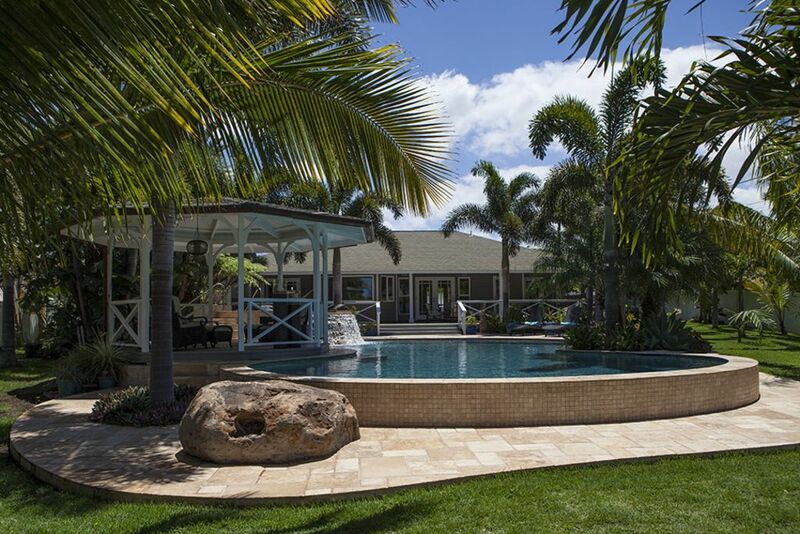 The home is the only structure on a 1/2 acre of manicured tropical landscaped property. When you rent this property, you and your guests will be in your own private fenced hotel style Oasis. The home accommodates 6 guests. There is on-site parking for four vehicles. There is a monitored security system for guest use. The master bedroom suite is located on the North side of the home with an attached bathroom and walk in closet. The master bathroom has a walk in glass shower. Bath towels are supplied for guest use. The bed is a California king size Tempur-pedic mattress. All bedding has 400 thread count or higher sheets and high end colorful cotton quilts and blankets. The furniture through out the bedroom and entire home is teak, sea-grass, and bamboo, giving the home the plantation island style setting. The french doors of the master suite, open to the back lanai, which is around 1000 sq ft. which opens to the lavish Oasis garden with over 80 palms, orchids, ferns, succulents, fruit trees, tropical plants, and an organic herb garden available for guest use. The custom 40,000 gallon, 800 sq ft saline pool beckons you in with the 10 ft tiled attached saline spa to relax your muscles after a long day of exploring the island. The pool is heated to 82 degrees by an electric heat pump in cooler months, and can be requested warmer with an additional security deposit. There is a custom 14 ft. gazebo that sits between the pool and spa for guests to gather that comfortably seats five. A rinse off shower is next to the gazebo for rinsing before and after pool use. The gazebo is a wonderful place to receive a massage, and has two waterfalls that spill off the roof into the pool. Folks say the falls sound like a strong waterfall flowing in Hana. The yard has more that 30 LED landscape lights to bring stunning night time ambiance to the Oasis. The pool and spa are lite by LED lighting that can change colors. A fire pit is located off the back end of the pool for cooler Kihei winter evenings, temperatures under 70 degrees. There are two hammocks for relaxing in the yard, one in the back corner, under the shaded thatched umbrella, and one on the lanai off the master bedroom. Located in the lawn is another seating area that is in a shaded area, giving a spectacular view of the spa waterfall, and pool deck area that seats five comfortably. Four chaise chairs are available for sun basking and the chairs can easily be moved around the yard to enjoy. The kitchen appliances include a refrigerator with filtered water, (a second refrigerator in the garage, so stock up at Costco), dishwasher, microwave, Vita-mixer, 12 cup coffee maker, coffee grinder, 4 slice toaster, electric tea kettle, electric 4 burner stove and oven, full size rice cooker, mixer, and knife sharpener. The kitchen is stocked beautifully with utensils, knives, glassware, plastic ware, bowls, serving platters, Pyrex, bake ware, and Circulon pots and pans. The pantry is stocked with coffee, white sugar, brown sugar, flour, spices, green tea, Lipton tea, olive oil, balsamic vinegar, and few other fun items. The kitchen is an informal setting, and is open to the living area. There is a dining table that seats four, and the large island has seating for four also. The living area also has french doors which open up to the 1000 sq ft lanai and Oasis backyard. In the living area there is a tiki sitting area with a 60 gallon tropical freshwater aquarium to sit and relax around. The 46' LED TV is enclosed in a teak cabinet, which has a Samsung blu-ray/DVD player that can stream Netflix, and is run through a Yamaha receiver with both indoor and outdoor speakers for the back lanai. You can stream your music from your iPod, iPad or any MP3 player through the system. There is free wireless internet. Original artwork is hung through the entire home. Central air conditioning for keeping cool. Ceiling fans are in each bedroom and in the living area. Games and puzzles are available for guests, along with a number of Hawaii themed books to read. There is a wall safe available for guest use. The home is child proofed for the safety of small ones with items such as, plug protectors, cabinet restraints, pantry lock, and wooden gates are available for guest use for doorways. We have a high chair, 2 portable pack and plays, a Joovey room large play pen, bed rails, and bouncer for guest use also. There is a full size washer and dryer inside the home, and we supply unscented laundry soap, Oxy clean, and dryer sheets for your use. In the garage there are extra tables and chairs available for guest use. Beach chairs, pool toys, floats, and coolers are also stored there and available for guest use. The second bathroom is a full bathroom with a bath tub. Located on the South side of the house with the other two bedrooms, the bathroom has a door that opens to the back lanai which makes it great for folks to easily use without walking through the house. The guest room located at the front of the home on the South side, has two brand new queen size beds. The last bedroom on the South side is a smaller bedroom, with a brand new queen size bed, and also has french doors that open to the back Lanai and yard. The back lanai is a 1000 sq ft, and has seating for 6 in comfortable relaxing chairs and rockers. There is a full size stainless steel radiated heat gas grill for BBQ's. There is a large teak cooler on the deck for ease of storing cold drinks. A peek-a-boo ocean view can be seen from the lanai. The lanai can be completely child-proofed off to keep small ones on the deck and away from the pool area for easy adult supervision. Please request us to childproof the lanai before your arrival. Kihei Oasis is a private, peaceful, relaxing atmosphere that will shed your cares away. Come for a romantic retreat, family gathering, or with a group of friends and discover the Oasis! Welcome! My name is Amy Bond, and I'm the owner/manager of Kihei Oasis. I live in Kihei, just a few miles from the property I named Kihei Oasis. I grew up in Park Ridge, IL, and lived in Chicago until 2001. I took a trip to Maui after learning how to scuba dive. While diving here, I decided Maui would be my new home. I've been here 18 years now, and I still feel as though I just moved here yesterday! The property was bought in 2007, and in 2008, the custom designed pool, spa, gazebo, and palm trees were added to the property. All the landscape was designed by me, and over time, I've added more gardens as the tree canopy shades new areas of the property. I moved from the property to convert it to one of Maui's first legally permitted vacation homes, as I feel the property is one meant to be shared with others. The home feels like a 'home' not a vacation rental. Folks who have come to visit are always in awe of the beauty of the home, the gardens, the pool and spa, and the immediate feeling of completely being away in a sanctuary, hence, why I named it 'Kihei Oasis'! I fell in love with this home immediately. At the time there was no pool, spa, gazebo, or gardens. I looked at it as an opportunity to design the yard I've always longed for. My idea of the perfect home in Hawaii is a smaller home on a large lot. A home that brings the outside in and the inside out. My favorite areas are the gazebo for relaxing and spending time with my family and friends in the pool and spa. My favorite space inside the house is sitting in front of the fish tank reading a good book. Taking a nap in the master bedroom with the french doors open, listening to the trades blow, is also another favorite! Peek-a-boo ocean view, lush tropical garden, over 80 palms! Garage has second refrigerator. The garage is not available to park in, but used for storage of items for rental such as extra tables, chairs, and toys. The 2nd fridge is located here also. Side by side with filtered water and ice machine, 2nd full size fridge in garage! White sugar, brown sugar, flour, coffee, filters, green tea, Lipton tea, and spices. Tinfoil, plastic wrap, zip lock bags, wax paper, and parchment paper. Organic herb garden available. All plates, glassware, plastic ware, bowls, mugs. This is a well stocked kitchen! A vita-mixer is there also! Kitchen is informal area, there is also seating for an additional four people at the 10 ft kitchen island. There is an outside dining table that seats 6 with an umbrella. 46' LED screen Samsung TV, housed in a teak cabinet, dedicated Netflix and Hulu account for Kihei Oasis TV, basic cable with local channels also. Yamaha receiver with ability to stream Pandora, or music from an iPad, iPod, or any mp3 player. Indoor/outdoor speakers. DVD/Blu-ray player, Samsung, newer movies available for rent located at Safeway, Longs, and Foodland through Redbox Vending machines. Assorted Hawaii themed books, plus a few others. Scrabble, apples to apples, cards, and puzzles. Stunning, private, hotel-style garden setting. Over 80 palms, tropical plants, ferns, orchids, and organic herb garden. There is a lawn seating area that seats 7 also. 1000 sq ft lanai that can be childproofed with a screen to keep small ones safe. Adult supervision is always needed. Patio is around entire pool area. Dining table with seating for 6 on lanai. 40,000 gallon, 800 Sq ft custom swimming pool, pool is HEATED to 82 degrees (option to heat higher with additional deposit) in winter months. 10 ft tiled spa attached to the pool that waterfalls to pool, over 1000 gallons! Legally permitted Maui vacation rental home! Basic House Rules: Quiet hours are from 9:00P.M.-8:00A.M., during which time the noise from the short-term rental home shall not unreasonably disturb adjacent neighbors. Sound that is audible beyond the property boundaries during non-quiet hours shall not be more excessive than would be otherwise associated with a residential area. Amplified sound that is audible beyond the property boundaries of the short-term rental home is prohibited. Vehicles shall be parked in the designated onsite parking area and shall not be parked on the street. No parties or group gatherings other than registered guests shall occur. We enjoyed this home and our host so much! The home is so thoughtfully set up - from a scale to a Vitamix to q-tips and spare pool toys. It's near a main road but you would never know it - the landscaping, trees, and waterfall from hot tub to the pool make you feel like you are in your own private resort. This home is a true gem and Amy is as warm and friendly as her home. Best Vacation House EVER !!! I have stayed at Kihei Oasis three times, and each and every time I love it more and more. Take a look at the pictures and multiply them by 1,000 and you might be able to truly appreciate how very special this vacation home actually is !!! The Homeowner is the best possible host and ensures that everything that you could possible need is provided and every question addressed. The minute that I leave this vacation home I can not wait to return, it is simply the best !! Gorgeous house with a backyard that's even more gorgeous. Beautifully landscaped with palm trees, custom hot tub, and gorgeous pool. Was a perfect Maui base for me and my wife, our 2 11-year-olds (loved the pool), and my mother-in-law. Kihei Oasis is THE place to stay! We highly recommend this house-we opened up the doors, put on some tunes & soaked up the outdoor lifestyle of Maui. There are numerous areas to dine/relax while enjoying the tropical landscaping (never knew over 20 different varieties of palm trees could exist in a backyard) & the water features/lighting of the pool & spa were lovely. Amy’s Aloha Maui welcome was much appreciated as she made us feel at home. The place is fully stocked (kitchen equipment, pantry & bathroom items), pool & beach toys/chairs, games, etc. Our family is blessed we had the opportunity to stay at Kihei Oasis & loved every day we spent here. No regrets....book today if your planning your Maui vacation! Kihei Oasis is conveniently located on the North side of Kihei town. If you're planning on doing lots of island sight seeing, such as visiting Hana, exploring upcountry areas such as Makawao, Kula, or Haleakala National Park, or driving to the West side of the island to Lahaina and beyond, Kihei Oasis is only a couple of blocks from the Piialani Hwy (31), but offers you and your guests your own private resort style vacation home, 3 bedroom/2 bath, on 1/2 acre property with a lavish custom saline pool and 10 ft tiled spa to spoil yourselves after you return from sight seeing. North Kihei is one of the drier areas with lots of sun and trade winds to cool the afternoons. Within a mile is Sugar beach, a five mile long beach suited for long walks or beach combing. It can be walked to, but most will want to drive, or explore beaches further South for swimming. Nearby activities such as batting cages, shopping, Kihei Canoe Club, Hawaiian Islands humpback Whale National Marine sanctuary, and Monsoon India Restaurant are within a 1/2 mile to 1 mile away from the property. The payment, less 10% is refundable up to 60 days prior to arrival date. For reservations cancelled within 60 days of arrival, the payment (less the 10%) is refundable only if we are able to refill the reserved dates. -As a courtesy, reservations are held for 72 hours, pending receipt of 50% deposit. -If we have a a window of less than 7 nights, we will accommodate shorter stays. Please always inquire! -Legally permitted Maui vacation rental home! Permit STKM 20130014 Hawaii, GET#005-603-5328-01, TAT#005-603-5328-01 -Payments accepted: Checks, or Visa, MC, AMEX, and JCB over the phone to Amy after booking confirmation and house rules are returned signed. Payments can be made through VRBO or Homeaway website but will show a "service fee" that is paid to them, reflecting 4-10% of the rental amount, starting February 2016.